This website page was originally developed to update our veterinary clients and community in Frederick County MD about the construction of Jefferson Veterinary Hospital's new animal hospital on Roundtree Road, Jefferson MD. It will remain to show the development and hard work of all involved in the veterinary hospital. Minutes from Jefferson Technology Park in Frederick MD This new Veterinary clinic will help our veterinarians provide the highest quality caring, compassionate veterinary medicine to pets in Frederick County, MD and the surrounding areas, including Middletown MD, Frederick MD, Knoxville MD, Lovettsville VA, Urbana MD, Adamstown MD, Boonsboro MD, Brunswick MD and Jefferson MD. December 6, 2016 - Move in Date For Jefferson Veterinary Hospital less than a week away!!! November 17, 2016 - Frederick County Md's Newest Veterinary Hospital Veterinarian/Owner Walking Through new Hospital. 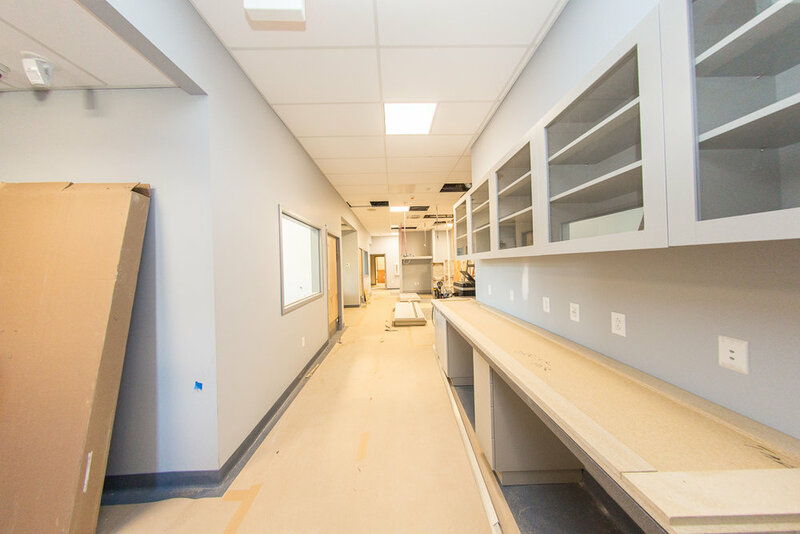 Veterinarian, and owner of Jefferson Veterinary Hospital, took a walk through the new animal hospital - the cabinets are completely installed and the treatment area and surgical suites are being finalized. We will have a number of treatment stations where our veterinarians will be able to help your pets and provide our veterinary technicians and veterinary assistants wth plenty of elbow room. This will be a significant space improvement on our current hospital, but our veterinarians and veterinary technicians have moving around in a small space down to an art form, so it will be interesting to watch everyone work with all this extra space. November 12, 2016 - Frederick County MD's Newest Animal Hospital Now Has Flooring and Cabinets Installed. Jefferson / Brunswick MD's new veterinary hospital has new flooring and cabinets installed - it's starting to look like a finished product! We are starting to plan the move from the existing veterinary hospital to the new animal hospital and it's a little daunting - the Jefferson location has been in existence since 1987 and that's a lot of equipment and "stuff" to move! Because everyone we know brings their pets to the veterinarian on their bike(!). This was a requirement of Frederick County that we install bike racks. Large dog examination room at Jefferson Veterinary Hospital. 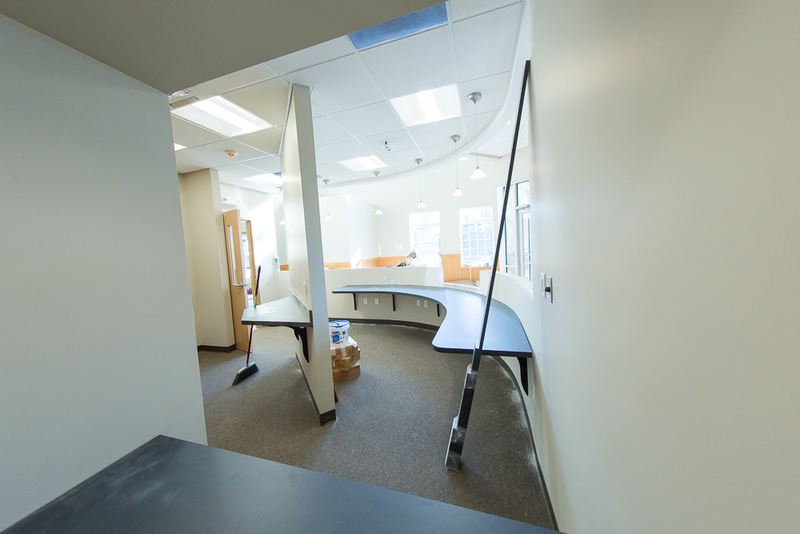 This room will have an automatic lift table to help us raise your pets from the ground to a height that our veterinarians can successfully examine them, making it safer for you, your dogs and our staff. View of the waiting room from behind the reception desk at Jefferson Veterinary Hospital. Treatment area of Jefferson Veterinary Hospital. The window on the right is to the surgical suites where our veterinarians will perform surgeries. The window at the far back are the kennels where our dogs will wait after they have recovered in the intensive care area within the treatment area. Surgical suite, where our veterinarians will perform surgery. Hallway of veterinarian's offices and veterinary technician's break room. Kennel area at Jefferson Veterinary Hospital - the glass doors are designed specifically for dogs who paw at the doors to help reduce the risk of injury to their paws. 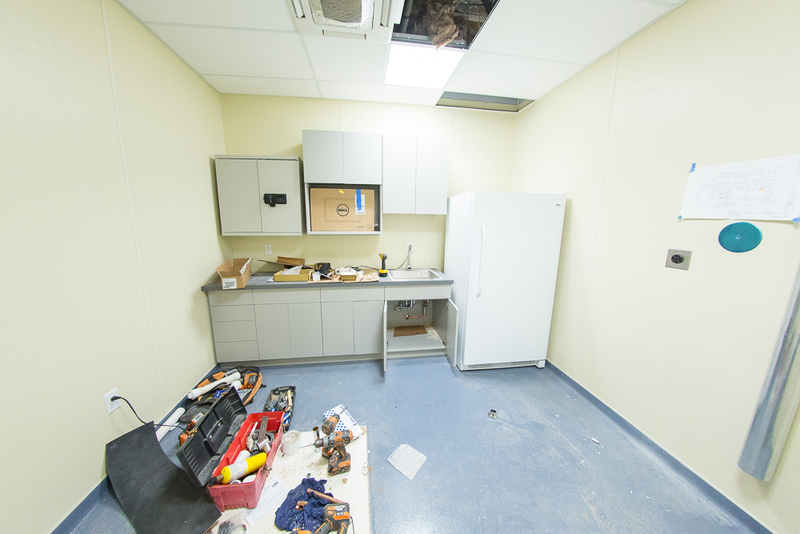 Interior of kennel area at Jefferson Veterinary Hospital. Dedicated bereavement room at Jefferson Veterinary Hospital. This room has a separate entrance so that recently bereaved pet owners will not have to walk across our waiting area to leave the building. Fully fenced relief area for Jefferson Veterinary Hospital patients. Exterior view of Frederick County Md's newest Animal Hospital. November 10, 2016 - New Floors, Landscaping and Blacktop! Jefferson / Brunswick MD Veterinary Hospital has finished flooring! It's getting close to completion! We now have flooring installed throughout the majority of your new veterinary hospital!! 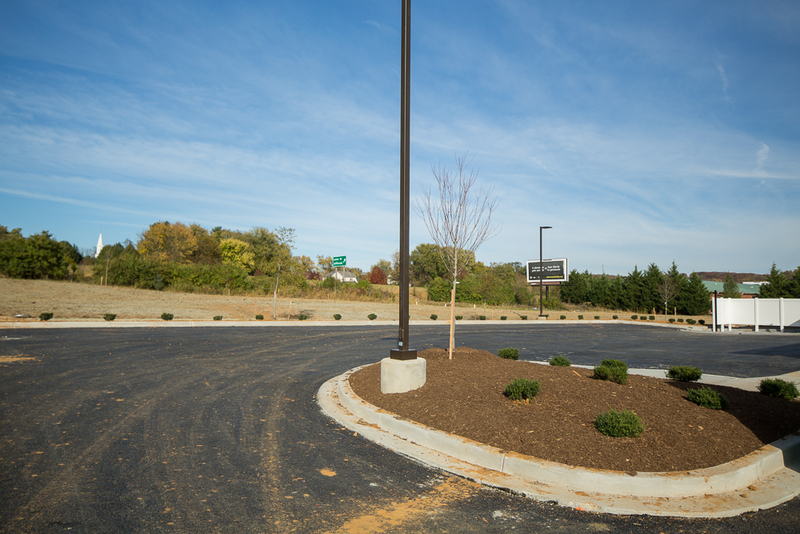 The outside has been landscaped and the curbing and blacktop has been put down. Mrs. Dr. A, who on many occasion lost a shoe in the thick clay like mud of the parking lot, has never been happier to see blacktop in a parking lot. 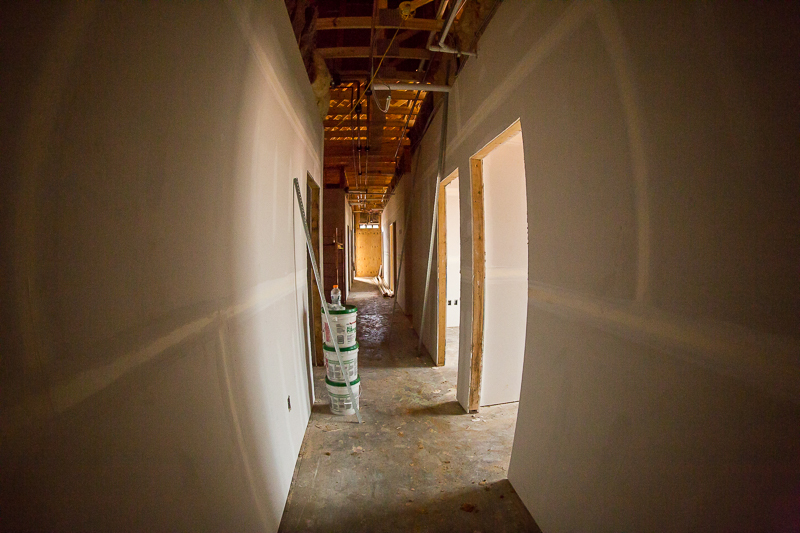 October 26, 2016 -We have ceilings and trim! New Veterinary Hospital in Frederick County MD getting close to completion. Jefferson Veterinary Hospital's new facility is getting closer to completion so that our veterinarians and veterinary technicians will have more space to help better serve your pets! 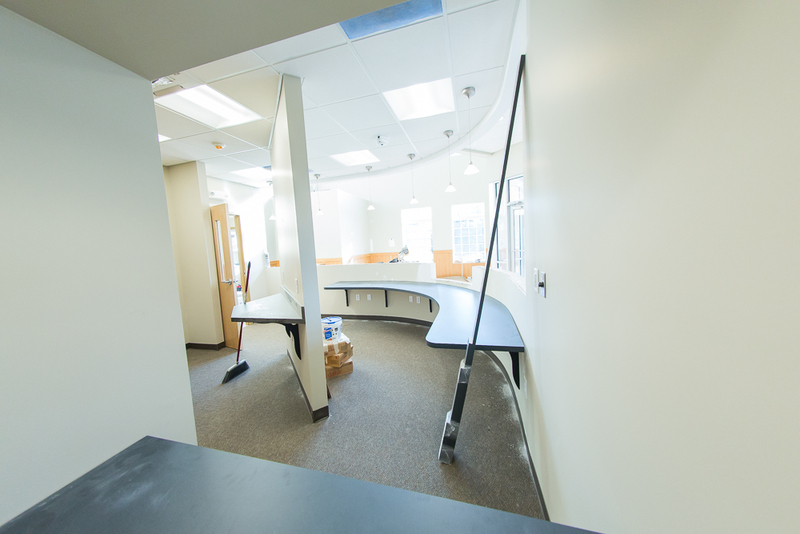 Frederick County's newest veterinary hospital's reception and waiting area. Large dog exam room - this examination room with have a table with an automatic lift that will also weigh your large dog. Bereavement room with private entrance and exit. September 24, 2016 - Let there be Walls! Frederick County MD Veterinary Hospital now has drywall. In addition to many important, but unglamorous items (electricity, running water, etc.) Jefferson Veterinary Hospital now has drywall up in the new facility! With a completion date estimated in mid-November, construction is really starting to look like it is almost done and the waiting room, reception, examining rooms, treatment and surgery areas are truly looking like we had imagined them (well, maybe without all the building debris, but after looking at this on paper for so long, we are excited!) Take a moment and check out where we are on construction! Front of the the Veterinary Hospital - the larger window is the veterinarian's main surgical suite. Bereavement room. This area has been specially thought out for when our clients face the difficult decision of letting their pets go. The room on the left is a bereavement room, and the door on the right to the outside is so that our clients won't have to walk through the waiting room on the way in or out of this most difficult of appointments. Dr. Ahalt does also offer in home euthanasia. Inpatient dog ward at the Veterinary Hospital, soundproofed so as not to disturb our neigbours. Rear dog exercise yard at the Veterinary Hospital - will be fully fenced in and in keeping with the design of neighbouring homes. Front of the Veterinary Hospital. It was muddier than it looks. Construction on Jefferson Veterinary Hospital's new animal clinic has been progressing rapidly. The shell of the building is now completely framed in and is under roof. It is now clear to see the floor plan and the rooms all look good sizes and the layout flows well. Our veterinary staff will have over four times the amount of space that they are used to, which is going to be just amazing. 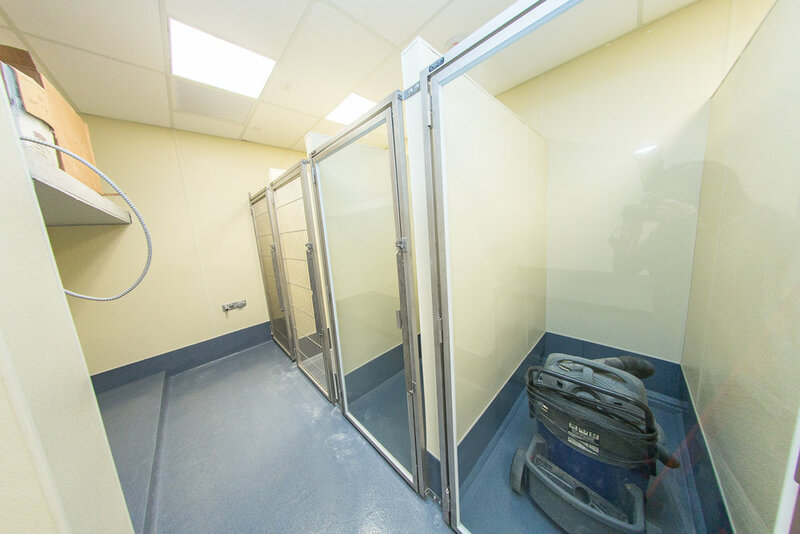 The dog kennel area is finish for our canine patients to have a little more space during recuperation than they do at the moment and the pharmacy area, x-ray room, surgical suite and treatment area look like they will be great. While Dr. Ahalt does offer in home euthanasias, we will also have a dedicated bereavement room to help comfort our clients if that most difficult of decisions ever needs to be made and happen in the veterinary hospital. One area that we have highlighted and paid particular attention to in designing the building is the waiting area. We realize the one at the existing veterinary hospital is less than ideal, the space just isn't big enough and the flow from where the receptionist and the exit are is less than ideal. The new waiting area will have significantly more space and is designed in a T, so that clients will have more space to move around. 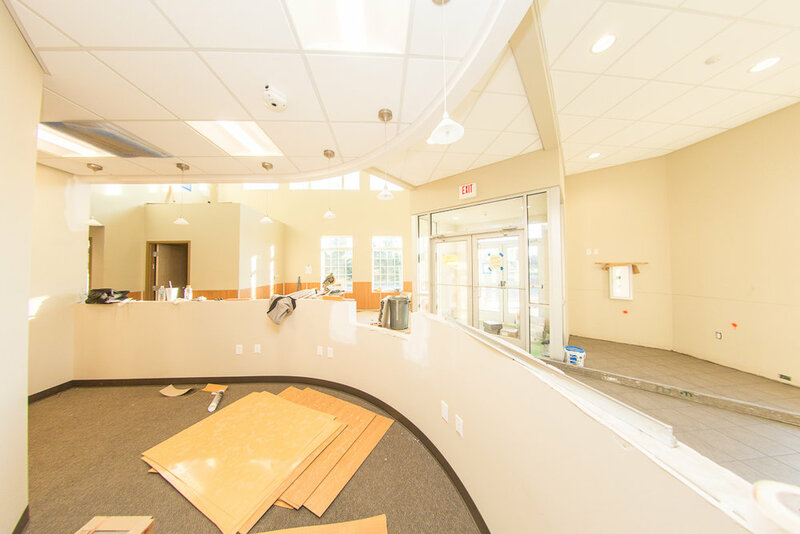 The entrance and exit is also in front of the reception area, which means that there will be significantly better flow in and out of the animal hospital. Words can only convey a few things, so we will leave you with some photographs of the outside and inside of the new veterinary clinic! Despite the copious amounts of rain seen across Frederick MD, the construction crew have been working on framing the building, giving it true shape and a good feel for the size of the interior. 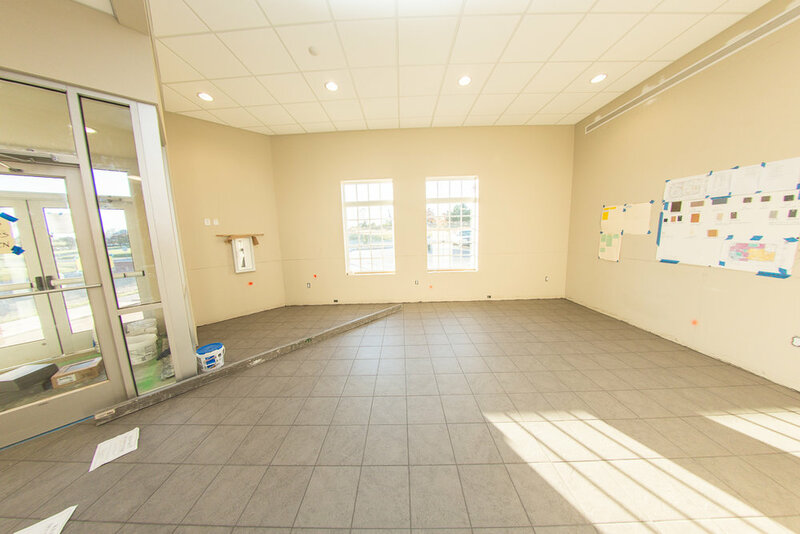 Veterinarian and owner, Dr. Ahalt, is pleased with the space that will be provided as, given the growth of the practice, the veterinarians and staff work in very cramped conditions and we know that it can be difficult for our clients when arriving to a busy waiting room. APRIL 21, 2016 - Frederick County MD's newest Veterinary hospital now has plumbing and electricity! The plumber has been laying pipes and we can start to see some of the outline of how your new veterinary hospital will look, and where sinks will be located. The big grey tubes visible in the middle of the second photograph are from the electrician. Construction of the veterinary hospital is proceeding onwards, although there isn't that much visible activity. The slab will be poured shortly, and once the walls go up, it will be visible from Roundtree road and commuters on 340 heading into Frederick. The past week, electricians were in installing the basics for the hospital, and the plumber began to lay out some of the pipes for the plumbing system. Veterinarian and owner of Jefferson Veterinary Hospital, Dr. Brooks Ahalt, called by the construction site of Frederick County MD's newest animal hospital to check on progress. He picked out the brick for the exterior of the veterinary clinic. Throughout the entire process, we have designed the animal hospital to be sympathetic with the houses in the neighboring subdivision and think that the brick fronting will help the veterinary clinic to blend in nicely. Below are the photographs of the brick Dr. Ahalt has selected, along with the exterior elevation to help show the placement of the brick on the finished veterinary hospital. APRIL 7, 2016 Frederick County MD Veterinary Hospital now has footers! Progress is continuing with Frederick County MD's newest Veterinary Hospital!!! The footers have now been reinforced with cinderblocks and are waiting to to be poured. The unpredictable weather we are having here in Frederick, MD April is pushing things back a little, but we know that once the foundation is poured rapid progress will be made on the building and cannot wait to see it!!! Mrs. Dr. A cannot wait until the parking lot is paved as every time she visits the site of the Animal Hospital her boots covered in clay/mud that just won't come off! The footers have been dug and prepped to be poured and the footprint of the new Veterinary Hospital is now clearly visible!!! The wider area with the big concrete squares will be the new entrance to your animal hospital! We hope that you will appreciate that beautiful view as much as we do! We are so excited to see this progress, and know that it won't be long before the new hospital will be clearly visible for everyone to see! Clare Ahalt Photography took a quick trip from Frederick MD to the freshly cleared site for the new animal hospital with her camera to get a few photographs - one thing is for certain that we can tell even before the foundation is dug out is that we have a beautiful view, and some great neighbors! We are continuing to make progress towards breaking ground on our new Jefferson Veterinary Hospital facility, and anyone driving by us on Roundtree Road, or just after the Lander Road exit towards West Virginia, or before this exit headed towards Frederick MD, on 340 will have noticed some construction equipment on the site. At this point in time, a culvert entrance has been created, our storm water management is underway and the building site has been prepared for construction! Dr. Ahalt will have a pre-construction meeting on March, 22, 2016 and we hope that construction will commence during the week of March 28, 2016. 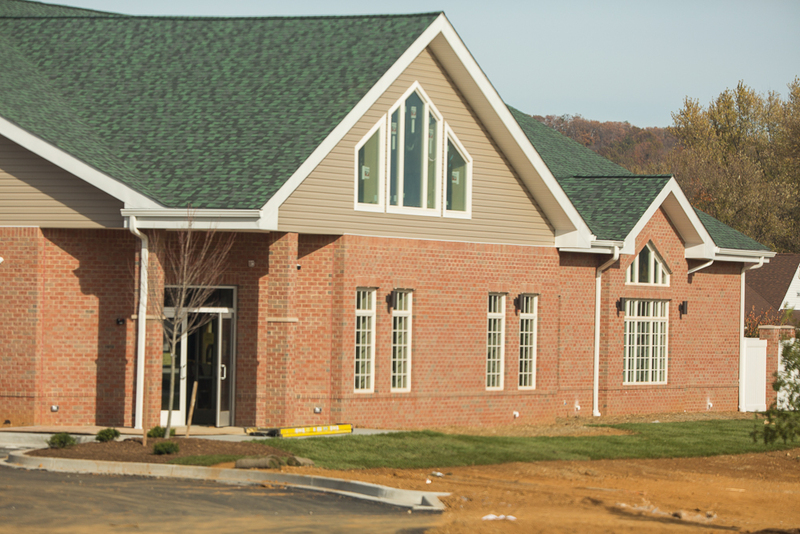 March 3, 2016 Construction Imminent for Frederick County's Newest Veterinary Hospital! Will be home to 3 Veterinarians and numerous veterinary technicians, veterinary assistants and office staff. Jefferson Veterinary Hospital is excited to announce that we will be opening a new facility in 2017! The new hospital will be located on Roundtree Road, less than half a mile from our current location. This facility will enable us to serve our clients more efficiently and effectively, providing almost 5,000 square feet additional space for exam rooms, surgical suites, waiting area and a dedicated bereavement room. This page will be kept up to date with developments so that our clients and community can follow along with the new construction! 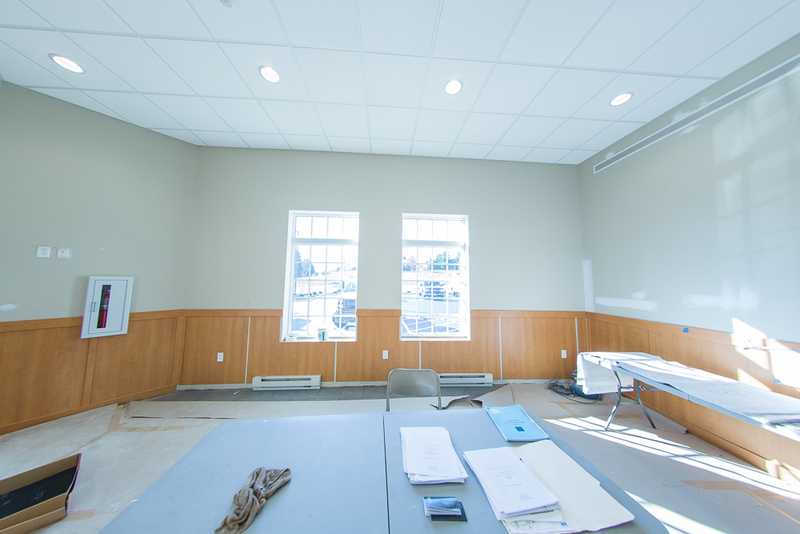 Business will continue as usual at Jefferson Veterinary Hospital and Brunswick Veterinary Clinic's current locations during construction of this new animal hospital.